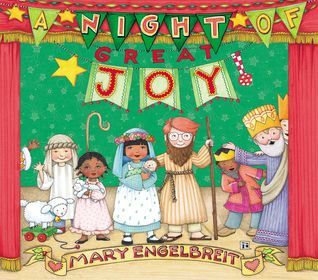 I have always loved looking at Mary Engelbreit's drawings but have not had a chance to read one of her books until now. I was impressed with the book as a whole. This was the story of Jesus birth. What I liked about the drawings was the bright colors and the details. She made the Christmas play look just as it would if you were at your church watching it. There are kids that are not happy with each other and kids being kids. She did a good job of bringing life to the pages. It is a quick telling of a timeless story.